Janice is a 40-something-year-old, young at heart, avid lover of the outdoors, wife, mother, and nurse! In 2016, life circumstances allowed her to complete the 48 4000 footers in NH. 32 of these peaks were done as solo hikes. During those many miles of solo hiking, She re-connected with herself and found hiking became a form of meditation. 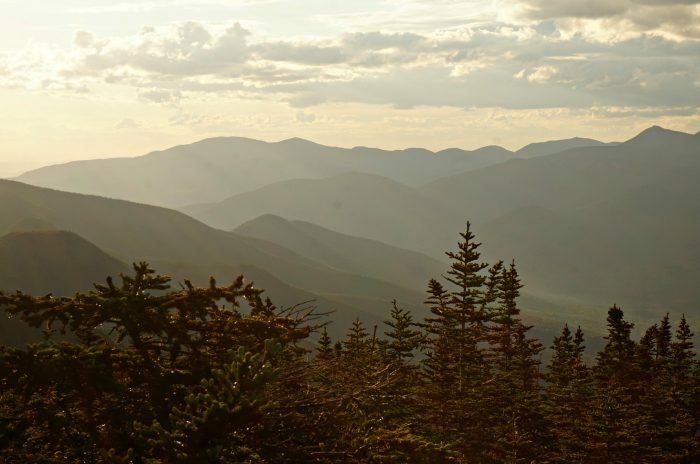 Janice is currently enjoying her quest to complete the highest peaks in New England on the New England 67 list! Three years ago, my daughter Emily and I started a tradition. Every summer, we would plan a mother-daughter overnight hike. This year’s plans incorporated a night at AMC Cardigan Lodge High Cabin AND a solar eclipse. Let’s just say I was excited. I never knew High Cabin existed until a month or so before I began planning for our overnight. I had done a sunrise hike with my pup Sadie on Mt Cardigan (which was spectacular) and came across High Cabin while exploring near the summit. High Cabin was built in 1931 and was renovated in 2004. It is a self-service AMC cabin that is open year round. It offers 12 bunks, a propane stove, a composting toilet, a spring (not always reliable), a seasonal wood stove and a beautiful setting. It was the perfect spot for us to use as a base camp for our overnight! It is a short two mile hike to High Cabin from Cardigan Lodge in Alexandria, NH. Our route included the Manning Trail, Holt Trail, Holt-Clark Cutoff, Clark Trail and Hurricane Gap Trail. It was a beautiful sunny day and we met quite a few groups hiking to the summit. Our solar eclipse glasses made the rounds as we were happy to share with any hiker we came across! There were several vantage points along the way that allowed us to catch a glimpse of the eclipse taking place. When we reached High Cabin, we unloaded most of our overnight gear and packed a few essentials to take with us for the final ascent. The last push to the summit via the Clark Trail included a short, steep, 15 minute climb up exposed bedrock leading to panoramic views of the surrounding landscape and nearby mountain ranges. The view is truly spectacular. At the summit, we were met with many other hikers who had the same idea as we did! Hikers donning solar eclipse glasses littered Mt Cardigan’s summit! Eclipse ready with our solar-eclipse glasses! After enjoying the summit, solar eclipse and beautiful views, we made our way back down to AMC High Cabin. It is situated in the perfect location between the summits of Mt Cardigan and South Summit. Both peaks are spectacular locations to enjoy either a sunset or sunrise. Emily and I took full advantage and headed out with headlamps to enjoy the sunset on South Summit which is less than a 10 minute walk from High Cabin. The sunset didn’t disappoint. We settled in for the night at High Cabin for an evening of card games and snacks. We even managed to watch the latest episode of Game of Thrones (cell service was great!). I almost felt like we were “breaking the rules”, but the goal of the overnight was to spend time together and that mission was accomplished! The next morning, we prepped a quick breakfast and heated up water on the propane stove to wash our dishes. After cleaning up the cabin, we packed up and headed down the trail to Cardigan Lodge and our vehicle. Another mother-daughter overnight hike in the books and another year of memories made. Have you ever enjoyed a hike up Mount Cardigan? Share your favorite experience and routes below in the comments!